MITCHELL, John Hipple, a Senator from Oregon; born John Mitchell Hipple in Washington County, Pa., June 22, 1835; moved with his parents to Butler County, Pa., in 1837; attended public and private schools and Witherspoon Institute; taught school; studied law; admitted to the bar in 1857 and practiced; moved to California and then to Portland, Oreg., in 1860; practiced law in Portland under the name of John Hipple Mitchell; corporation attorney of Portland 1861; member, State senate 1862-1866, serving the last two years as president; unsuccessful candidate for election to the United States Senate in 1866; elected as a Republican in 1872 to the United States Senate and served from March 4, 1873, to March 3, 1879; after his election, opponents tried to prevent his seating, charging him with bigamy, desertion, and living under an assumed name, but a Senate committee decided the charges did not merit investigation; chairman, Committee on Railroads (Forty-fifth Congress); unsuccessful candidate for election to the United States Senate in 1882; again elected as a Republican to the United States Senate on November 18, 1885, for the term beginning March 4, 1885; reelected in 1891 and served from November 18, 1885, until March 3, 1897; unsuccessful candidate for reelection; chairman, Committee on Transportation Routes to the Seaboard (Fiftieth Congress), Committee on Railroads (Fifty-first and Fifty-second Congresses), Committee on Claims (Fifty-second Congress), Committee on Privileges and Elections (Fifty-fourth Congress); resumed the practice of law; again elected as a Republican to the United States Senate and served from March 4, 1901, until his death in Portland, Oreg., December 8, 1905; chairman, Committee on Coast Defenses (Fifty-seventh and Fifty-eighth Congresses), Committee on Interoceanic Canals (Fifty-eighth Congress); at the time of his death, had been indicted and convicted of having received fees for expediting the land claims of clients before the United States Land Commissioner and an appeal was pending; interment in Riverview Cemetery. American National Biography; Dictionary of American Biography; Cummings, Hilary Anne. 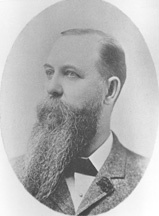 John H. Mitchell, a Man of His Time: Foundations of His Political Career, 1860-1879. Masters Thesis, University of Oregon, 1985; OCallaghan, Jerry A. Senator John H. Mitchell and the Oregon Land Frauds, 1905. Pacific Historical Review 21 (August 1952): 255-61.